This year’s big news regarding the reporting of oil reserves in World Energy Outlook 2015 is that this annual report now discusses “resources that are technically possible to produce” and what proportion of these are proven reserves. When I was working on Chapter 17, The Peak of the Oil Age for my new book a few weeks ago I discussed the difference between technically producible resources and reserves. To support that discussion I made a figure explaining how different types of crude oil are classified. All the oil formed millions of years ago is termed, “Total Petroleum Initially in Place (PIIP). We have now found most of the world’s producible oil but there are still some oilfields yet to be discovered. (Details on this will be found in the book.) Of all the oil that we have already found there is some that cannot technically be produced, i.e. is “unrecoverable”. The remaining oil is divided into two classes – non-commercially producible (Contingent Resources) and commercial oil. When describing oil reserves, 1P is that which will be produced with 90% certainty, 2P with 50% certainty and 3P with 10% certainty. In the image above, the yellow field and the “green” commercial oil are those termed, “resources that are technically possible to produce”. It is this volume that the IEA has now begun to promote as a shield against future declining oil production. Let’s now look at Table 3.4 from WEO2015. First, we can note that there is no longer any detailed classification of different type of reserves. Only one reserve number is given – “Proven Reserves”. Therefore, we cannot see whether these reserves are conventional oil or unconventional oil (or both). Instead, we see a display of various classifications of resources. The IEA justifies this new system of describing oil yet to be produced by saying that one usually does not distinguish between conventional and unconventional oil reserves. This is correct if one studies the BP Review of World Energy or the Oil&Gas Journal, two sources that the IEA cites. However, the reserves these sources refer to are not 1P reserves. 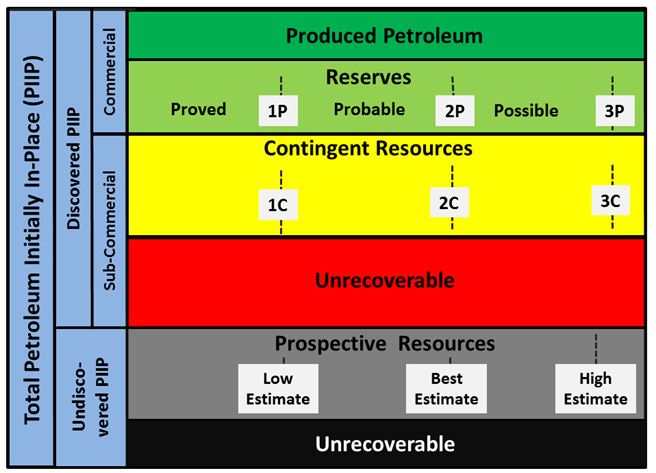 At the same time, the IEA states that Proven Reserves are those with 90% certainty to be produced (1P). The 1P, 2P, 3P reserve system is commonly used for crude oil. The Latin Americas appear to have large reserves but one should realize that 290 billion barrels (Gb) of those exist in Venezuela’s Orinoco belt and are very heavy oil from oil sands. The rate of production of this oil is only 1 Mb/d and the production is expensive. In the American reserves Canada’s oil sands contribute 168 Gb. Table 3.4 also shows that there is 1,000 Gb of “Kerogen Oil” in the Americas and that is very much an example of raising false hopes. There is no commercial production of kerogen oil in the USA. The world’s foremost production of kerogen occurs in Estonia and the volume is not large. For the 1P reserves that the IEA report to be classified thusly requires that these reserves are in production. The IEA should at least have done like BP and stated the crude oil component of these reserves separately. 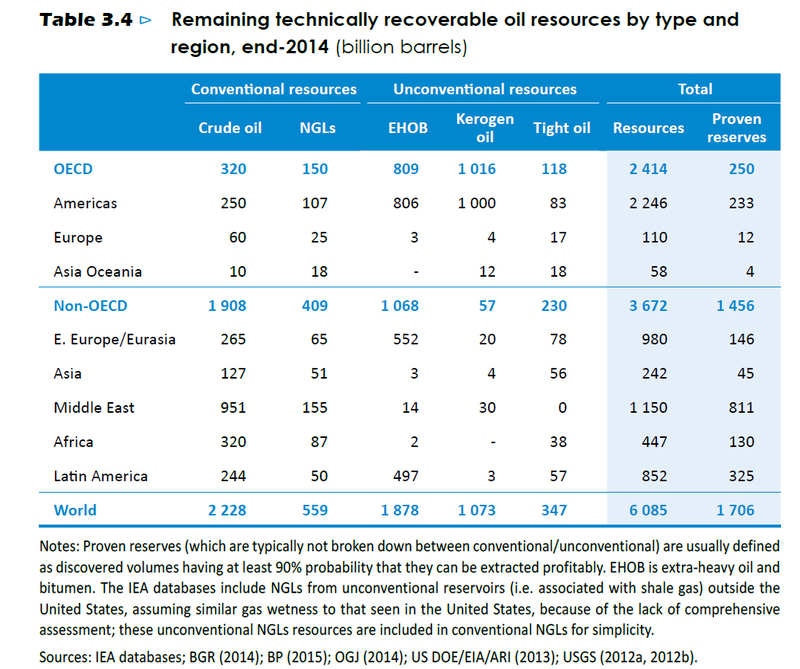 Anyone wanting to use the numbers in Table 3.4 should have a deep knowledge on how oil reserves are reported. In conclusion the IEA states that the OECD nations of Europe have 12 Gb of proven reserves. BP states these as 6.5 Gb for Norway, 3 Gb for the UK, 0.6 Gb for Denmark, 0.6 Gb for Italy and a little more in other nations to give a total of 12 Gb. However, BP’s numbers are for 1P + 2P reserves that have a 50% certainty of being produced. They are not only 1P reserves. WEO2015’s section on resources and reserves concludes with this text, “Proven reserves, as published by the Oil and Gas Journal or the BP Statistical Review (and mostly taken from government sources when available) are largely unchanged compared to last year, indicating that all production since the last review has been replaced by new reserves.” How reliable is this statement? The O&G Journal collects its reserve data by asking the governmental authorities of oil producing nations how large their reserves are. If they receive a response they give the numbers in their new data but if no response is forthcoming for one year then they use the previous year’s numbers. This numbers are then adopted by BP. The classic example of this is the OPEC nations. In 1986 the United Arab Emirates reported that their reserves had increased from 33 Gb to 97 Gb without having discovered any new oil fields. Now, 28 years later, the UAE’s reserves are still stated as being 97 Gb despite having produced 27 Gb of oil during that period. Meanwhile, in 2014 the IEA stated that we are discovering less than half the volume of oil that we consuming. 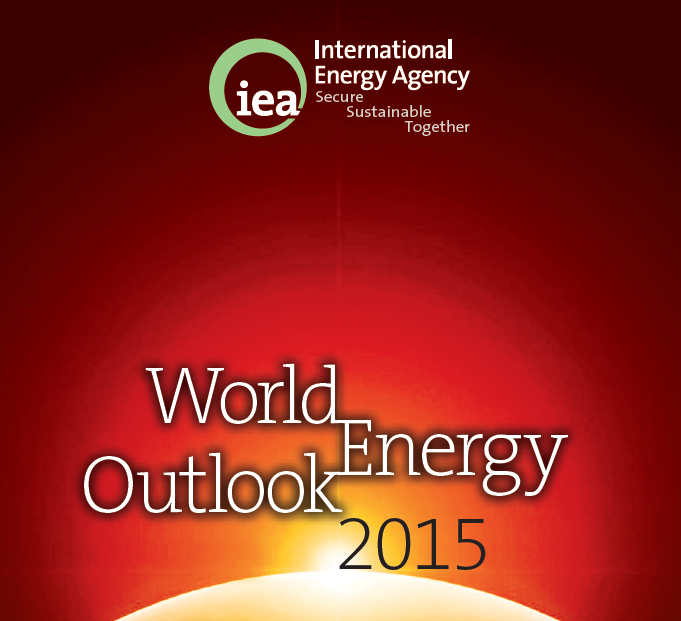 Previously, I mentioned that the WEO reports are presented as the energy industry’s “bible”. Now it seems as if every nation that desires to interpret the words of the IEA will need to acquire an “oil theologist”!